Skip to “PyCharm’s sucky refactorings” if you don’t have much time. Then there was The End of Dynamic Languages by Elben Shira, a follow up - Have Static Languages Won? by Maxime Chevalier-Boisvert, and one more - THE SKY IS NOT FALLING by Dmitri Sotnikov. That echos with my frustration as I am improving my Python - slower by far than my speed at developing with Java (even if ultimately the libraries are easier to use). Example code by the shovelful, people! I rely on the intellisense of the JetBrains products to get me there generally, but sometimes I’m off to google or stackoverflow for how-to. Some language/librrary/framework authors don’t like to include examples in their API documentation. Sure railroad diagrams are pretty, but if you don’t have a few examples of use inlined with your API doc you just disenfranchised significant percentage of programmers who learn exclusively by looking at good examples of use. Yes, people learn things differently. Some like tutorials, yet some no love for them. Some like API docs, yet some feel naked if that’s all they have. Some people need examples (and permutations thereof) to get there. Note: Jetbrains’ IDEs have been the worlds best for 16 years straight. Here’s the high bar for refactoring - Danio Sato moving code like it were wet paint perfectly safely (ffwd 2.5 minutes to skip the explanation of the experiment). This is only 12 mins of your time, and you should be changed if you’ve never seen Intelli IDEA in action before, in the hands of an expert at least. Danilo’s blog entry on the same. Except you can’t do more than 20% of that in PyCharm (sister product to Intellij IDEA - compiled from the same codebase). 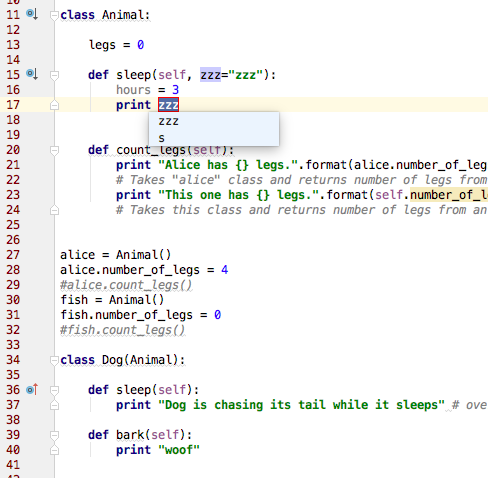 PyCharm knows that Dog is a subclass of Animal (look in the left margin), and that the sleep() method is overridden. Yet when I do the refactoring operation, it is only offering an optional parameter refactoring. It is not asking me if I want to make it non optional. It is not asking if I want to do it in subclasses too (related to that last). 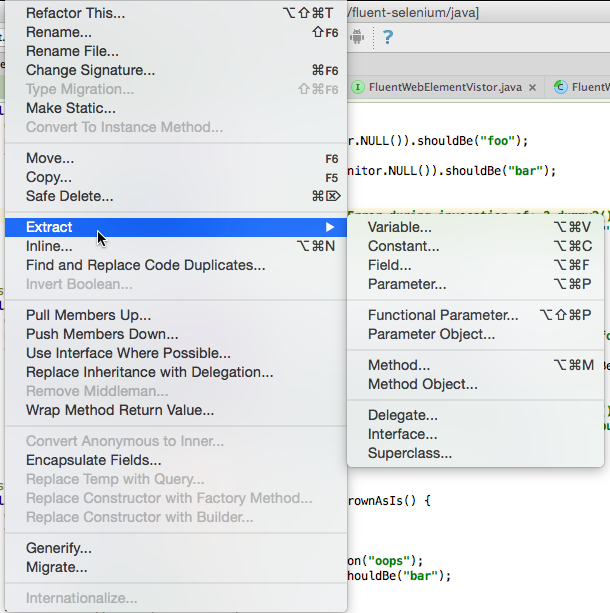 In IntelliJ I would see callers pass in “zzz”. I would have to then review the Dog usage to see if I wanted to use the parameter, given it is also doing a print with a different string (IDEs could never know my intentions re the use of that parameter). I added a “hours” var too. I mean versus Shane Engelman’s GH version. Try to Extract-Parameter that one. 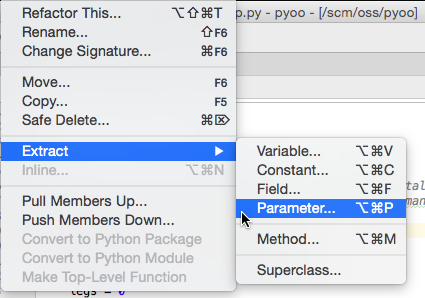 PyCharm 5.0.1 does nothing at all. Weird. PyCharm (etc), as well as the AST it has of the parsed source, needs to retain type and usage information from the last invocation of the application/service/solution. Better still, it should glean type and usage information from invocations of tests. Python wouldn’t be Python if it has static typing adornments, but JetBrains could make perfectly hidden type info, and it would be a significant boost to PyCharm’s capabilities. The downside is the programmer using PyCharm has to run that test suite. Most likely, there would a social contract for you to run it at intervals as you are working on the codebase. If that meta info were collected, then hovering over a variable name could cause a tool-tip that would say what type it is. Of course duck-typing might mean that a variable used at a certain scope may have one of a number of alternates of types (again collected from test runs). If you’re not refactoring towards “most stable”, then your solution isn’t going to be maintainable in the future. If your IDE does not have refactoring support it is pretty easy to predict that refactoring is a rare event for your team.